Last week, Stephen Moore, an associate of Arthur Laffer and national consultant, penned an opinion piece in the Wall Street Journal making a claim totally unsupported by facts – that tax cuts are improving North Carolina’s economy. Tax cuts that primarily benefit the wealthiest people and large, profitable corporations, coupled with the drastic reduction in the effectiveness of unemployment insurance to help those struggling to get by have not ushered in a stronger economy. Instead, North Carolina continues to experience a slow, uneven economic recovery buoyed only by national trends as the state backs away from the kinds of investments that are crucial to growth. There is no link between the tax cuts and the revenue increase the state is experiencing this year. Instead, pundits like Stephen Moore and others in North Carolina, take simultaneously occurring conditions and claim a connection that doesn’t exist. This would be like someone looking at the relationship between per capita cheese consumption and civil engineer doctorate awards and declaring that everyone should eat more cheese so we can produce more civil engineers. What’s really happening is that state revenue is coming in above expectations because of the realization of capital gains and business income growth. It’s the same thing being seen in states that haven’t cut taxes (and one—California—that has actually raised taxes). Higher job growth rates and productivity are welcome signs in North Carolina. But it’s important to keep in mind our state’s economic performance is still below historic levels. 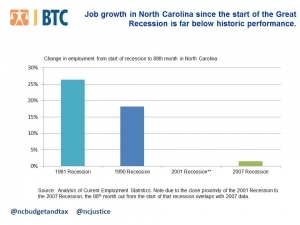 Take the change in employment, North Carolina’s job growth since the start of the last recession is well below where it should be relative to other similar time periods and that means we continue to struggle to repair the damage of the Great Recession. Rather than helping the state’s economy, it’s becoming even clearer that the tax cuts hamper our ability to address the real challenges in our economy. For one thing, all income growth since the start of the recovery has gone to the top 1 percent of North Carolinians – those making more than $1 million a year. Average North Carolinians have seen their wages fall despite the official recovery. The jobs being created since the recovery are overwhelmingly work that pays too little to support a family and build a future. And, two thirds of the state’s counties have fewer people employed than before the Recession started. Contrary to Stephen Moore’s hopes, there is no payoff from tax cuts in North Carolina. Instead, the state will struggle to rebuild and too many North Carolinians will struggle to get by because policymakers failed to realize that tax cuts are not an economic development strategy worthy of our state’s people and history. trickle down is a myth. period. If things go right under Conservatives, there is no way it was due to anything they did, and they are still not “investing” in unneeded programs…and leftists are justified. If things go wrong under oppressive leftist rule, it is the fault of Conservatives because they did not agree with us, not because our policies have rarely worked in the real world. If things go right under the oppressive leftist rule, well. That is a new one….you never have seen that reported. What about citing some verifiable date to support your comment “a fact that has been proven time and time again”? Breitbart, Faux News, Conservapedia and your favorite the Daily Haymaker aren’t exactly reputable verifiable sources of data. Like every other comment you post here, nothing to support your reflexive nonsense. What about citing some verifiable datA to support your comment “a fact that has been proven time and time again”? Breitbart, Faux News, Conservapedia and your favorite the Daily Haymaker aren’t exactly reputable verifiable sources of data. Alan, as you are and employee here you have access to the stories on the pulse. pulse.ncpolicywatch.org is my source. Just look at each story and you will see how the blame is shifted each time. You have to actually think though, so I don’t expect you to get it. And I am not going to do all your thinking, googling, and daily grooming for you. I know as a progressive you need help with all things, but your usual source to rely on is the government not individuals.